Please use the Post Code “EH30 9SS” to get you to the Glamping site. From the M90 towards Edinburgh, keep left to take the turn off to the A904 roundabout towards South Queensferry. Take the third exit on the A904 roundabout to stay on the A904 towards South Queensferry. Take the second exit over the next two roundabouts to stay on the B800 ‘Ferry Muir Road’. 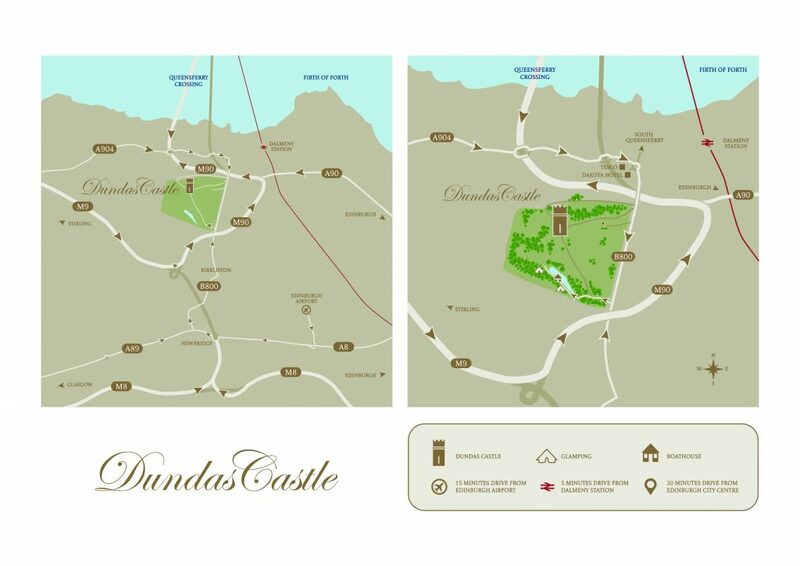 Continue driving along the B800 past the main Dundas Castle entrance and the Dundas Parks Golf Club. Take the next right to Glampotel Dundas Castle. Continue down the drive and take the first left turn signposted to the Boathouse and Glampotel. Please stop when you arrive at the Glamping registration hut for our wardens to welcome you and show you to your unit. Drive down the A90 towards the Forth Road Bridge and keep left to merge onto the M90 to South Queensferry. Keep left on the M90 to take the turn off to the to the A904 ‘South Queensferry’. Continue using the directions above from point 2. Exit Edinburgh Airport, when you reach the A8 Glasgow Road roundabout take the fourth exit towards A8 Newbridge. Continue along the A8 through Newbridge, at the next roundabout take the third exit onto the A89 Edinburgh Road. Stay on the A89 for half a mile and then turn right onto the B800 towards Kirkliston. Keep on the B800 and at the crossroads in Kirkliston, go straight ahead, staying on the B800. Take the immediate left turn over the first hill after Kirkliston, at the entrance signposted Glampotel Dundas Castle. Continue using the directions above from point 6. Follow the signs to Edinburgh Airport on the City of Edinburgh Bypass until you reach the Gogar Roundabout, take the first exit onto the A8 Glasgow Road. Continue along the A8 for three miles towards Newbridge. Continue using the directions above from ‘Driving directions from Edinburgh Airport’ point 3. Drive along the M8 towards Edinburgh, take a left turn before entering Newbridge towards B800 to Kirkliston. Continue using the directions above from ‘Driving direction from Edinburgh Airport’ point 4.